Minister Feehan (C) with Chief James Ahnassay (L), MLA for Peace River Debbie Jabbour (R) and council members of Dene Tha’ First Nation. 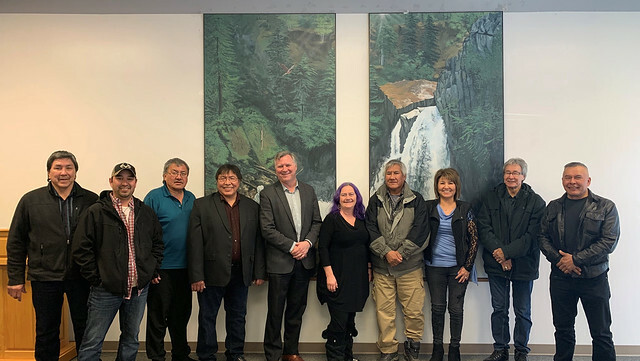 The $2.1-million project will connect the Dene Tha’ First Nation in Bushe River to the Town of High Level water treatment plant by waterline. This is the 10th project funded through Alberta’s First Nations Regional Drinking Water Tie-In Program, which will benefit 14 First Nations. The project is part of the province’s $100-million commitment to ensure First Nations in Alberta have access to safe, reliable drinking water. Construction of the waterline will begin once the design phase is completed. The project is expected to be in place by 2020. Budget 2017 committed $100 million to provide clean, safe drinking water to First Nations, where feasible, through the First Nations Regional Drinking Water Tie-In Program. Construction of a regional waterline to the Alexis Nakota Sioux reserve boundary was completed in June 2018. Construction of a regional waterline up to the Whitefish (Goodfish) Lake First Nation reserve boundary is under construction and is expected to be completed in 2020.